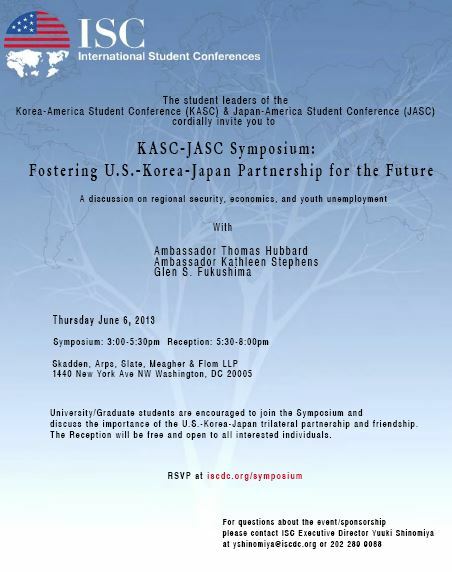 ISC will be holding the inaugural KASC-JASC Student Symposium: Fostering U.S.-Korea-Japan Partnership for the Future on Thursday, June 6 (Panel Discussion 3:00 – 5:30 pm, Reception (5:30 – 8:00 pm). The Symposium will gather student leaders of KASC and JASC to discuss issues relevant to the U.S.-Korea-Japan trilateral partnership. Given the current geopolitical tension, this event will foster a thoughtful and well-needed conversation among our young leaders about the importance of the trilateral relationship. Student leaders will lead an interactive panel discussion with Ambassador Thomas Hubbard, Ambassador Kathleen Stephens and Glen S. Fukushima. Representatives from Japanese and Korean Embassy as well as State Department are also invited. For any questions, please contact Yuuki Shinomiya, ISC Executive Director at yshinomiya@iscdc.org or call 202-289-9088. More information available at iscdc.org/symposium. This entry was posted in JASC, KASC and tagged JASC, jasc 65, KASC, KASC 6 by ISC Admin. Bookmark the permalink. I’m a university student from South Korea who came to DC as a participant of Korean governmental global internship program. I am very excited to attend this symposium with future leaders. I’d like to see a discussion about a trilateral relationship through this active symposium.